If someone were to ask me what a traditional weeknight dinner or meal were to look like, pasta would be the first thing that comes to my mind. And just when the standard marinara or pesto sauce pasta began to feel an all too common dish in my kitchen, I came across a new, delightful base for the classic; roasted red pepper sauce. It’s a robust, velvety, and quite aromatic sauce that’ll bring a nice variety to a family favorite dish! This version of the sauce featured traditional, oven-charred red peppers, onions, and garlic. Using just a splash of milk and some almonds to bind the sauce, ensured a rich, smokey product with layers of flavor from the alliums! Needing an equally delicious pasta to pair with this sauce, it was decided to use whole grain pasta, which adds a subtle nutty flavor into the meal. The pasta also has some fiber in it so it’s fit for a weeknight meal too. 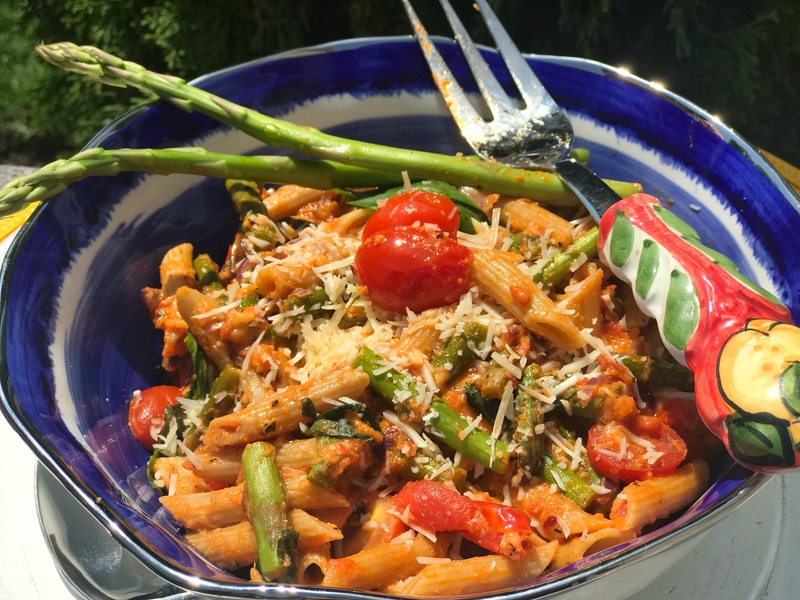 This roasted red pepper pasta has a gorgeous orange hue and such a balanced texture with the smooth sauce and crisp veggies, that it’s just screaming to be eaten. With all aspects of a great family meal like healthiness and satisfaction kept in mind, this dish will add some much needed variety into your weeknight dinners and a totally satisfying end to your day!